Fellow Indonesia-based blogger Rob’s got a funny posting about the Spanish basketball team putting a slant on things Chinese. So stupid that it makes one ROFL. 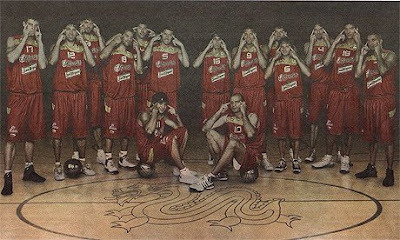 The Spanish Team is finding itself at the centre of a racism row as a photo has emerged of the whole team seemingly slanting their eyes. In this politically correct world that we live in this is undoubtedly going to be viewed as racist even if the intent was not to be so. The ad was for a courier company. However, what is interesting is that the Spanish basketball team has just signed a four-year deal with a Chinese shoe company, Li Ning Footwear. Is there a higher purpose to blogging?